Upper Arm Lift Surgery in Honolulu Hawaii | Kevin Dieffenbach, M.D. 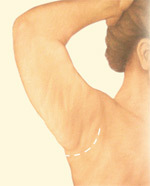 the under portion of the upper arm, from the underarm region to the elbow. Fluctuations in weight, growing older and even heredity can cause your upper arms to have a drooping, sagging appearance. Exercise may strengthen and improve the underlying muscle tone of the upper arm, but it cannot address excess skin that has lost elasticity or underlying weakened tissues and localized fat deposits. If the underside of your upper arms are sagging or appear loose and full due to excess skin and fat, brachioplasty may be right for you. A special note: In order to achieve your improved image, there will be a scar on the inside of your upper arm. The success and safety of your arm lift procedure depends very much on your complete candidness during your consultation. You’ll be asked a number of questions about your health, desires and lifestyle. Your plastic surgeon will also discuss where your procedure will be performed. Brachioplasty may be performed in an accredited office-based surgical center, outpatient or ambulatory surgical center, or a hospital. If your arm lift is performed on an outpatient basis, be sure to arrange for someone to drive you to and from surgery and to stay with you for at least the first night following surgery. Incision length and pattern depend on the amount and location of excess skin to be removed, as well as the best judgment of your plastic surgeon. Incisions are generally placed on the inside of the arm or on the back of the arm, depending on the surgeon’s preference, and may extend from the underarm (axilla) to just above the elbow. If fat is to be reduced during your arm lift, it will be excised or treated with liposuction. Depending on your specific conditions, incisions may be more limited. Then, underlying supportive tissue is tightened and reshaped with internal sutures. Finally, the skin is smoothed over the new contour of your arm. Your incisions will be closed with absorbable sutures, or stitches that will be removed within 1-2 weeks following your brachioplasty. The smoother, tighter contours that result from brachioplasty are apparent almost immediately following your procedure, although initial results will be somewhat obscured by swelling and bruising. Your new, shapely and toned upper arm is dramatically improved both in appearance and feel. The decision to have brachioplasty is extremely personal and you’ll have to decide if the benefits will achieve your goals and if the risks and potential complications are acceptable. You will be asked to sign consent forms to ensure that you fully understand the procedure you will undergo and any risks and potential complications. These risks and others will be fully discussed prior to your consent. It is important that you address all your questions directly with your plastic surgeon. It is natural to feel some anxiety, whether excitement for the anticipated outcomes or preoperative stress. Discuss these feelings with your plastic surgeon. Following your physician’s instructions is key to the success of your surgery. It is important that the surgical incisions are not subjected to excessive force, swelling, abrasion, or motion during the time of healing. Your doctor will give you specific instructions on how to care for yourself. Be sure to ask questions: It’s very important to ask your plastic surgeon questions about your arm lift procedure. It’s natural to feel some anxiety, whether it’s excitement for your anticipated new look or a bit of preoperative stress. Don’t be shy about discussing these feelings with your plastic surgeon. Following your surgery, dressings or bandages may be applied to your incisions, and your arms may be wrapped in an elastic bandage or a compression garment to minimize swelling. A small, thin tube may be temporarily placed under the skin to drain any excess blood or fluid that may collect. You will be given specific instructions that may include: How to care for the surgical site and drains, medications to apply or take orally to aid healing and reduce the potential for infection, specific concerns to look for at the surgical site or in your general health, and when to follow up with your plastic surgeon. Cost is always a consideration in elective surgery. Surgeon’s cost for an arm lift may vary based on his or her experience, the type of procedure used, as well as geographic office location. When choosing a plastic surgeon for an arm lift, remember that the surgeon’s experience and your comfort with him or her are just as important as the final cost of the surgery. 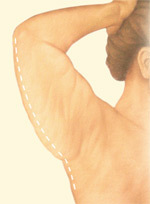 Arm lift: A surgical procedure, also known as brachioplasty, to correct sagging of the upper arms. 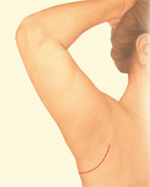 Brachioplasty:A surgical procedure, also known as arm lift, to correct sagging of upper arms. General anesthesia:Drugs and/or gases used during an operation to relieve pain and alter consciousness. Hematoma:Blood pooling beneath the skin. Liposuction: Also called lipoplasty or suction lipectomy, this procedure vacuums out fat from beneath the skin’s surface to reduce fullness. 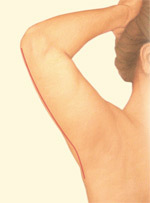 Skin laxity: Degree of loose skin.